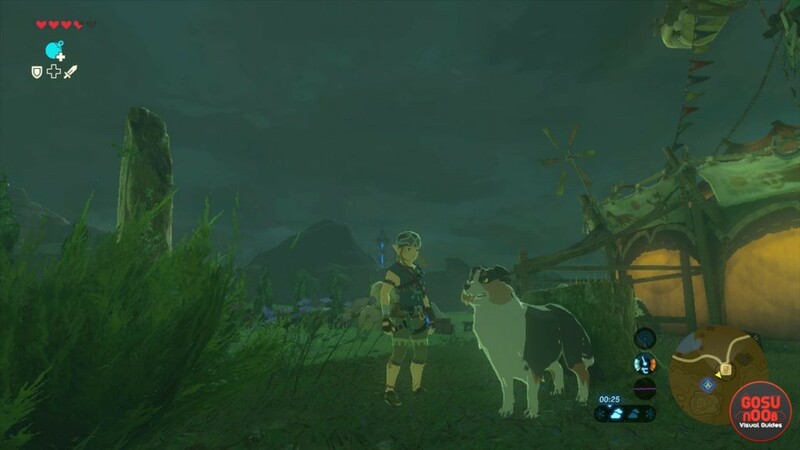 Dog treasures are hidden items you can find in Zelda Breath of the Wild. You can get them by bribing certain dogs with food. When you do, they’ll lead you to the treasure. There are fourteen of them around the world, and they can lead you to all kinds of stuff. 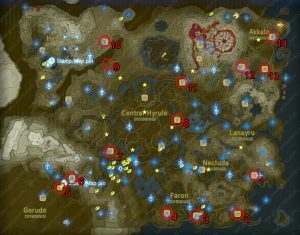 In this guide, we’re going to show you Zelda Breath of The Wild dog treasure locations, what they contain. When you find a dog that looks like a border collie, offer him three pieces of meat. He’ll gulp them down and lead you to a nearby hidden treasure. We’ve seen 14 of them so far, mostly around stables. We’ve heard people claim they had success when feeding them fruit as well, but we never managed to make this work. Meat is harder to come by, but is guaranteed to work. Don’t mistake the red puff of smoke that sometimes appears around the dog’s head for appreciation for the food – they sometimes appear when you just hang around and spend time with the animal. In order to find the one in Tarrey Town, you’ll first have to help build the city. This is done through the From The Ground Up quest. What about the Dueling Peaks Stable? There is a dog behind the Inn between the Inn and some fenced in goats. I fed it 3 Raw Meat and 2 Prime Meat before it led me to a chest containing a Silver Rupee. I have feed the dog at Hateno Village Farm … A LOT of meat .. like 7 raw meats and probably around 10 apples.. and nothing. Am I feeding the wrong dog? will one seek out treasure and the other not? I got the dog at Dueling Peaks Stable to go to the treasure ( that was right around the corner) with a few meats, (including one Raw Prime Meat) but not thing brown dog at farm. And does anyone know if you have to use the dogs to find chest? Can you just walk around with magnet out looking for chest under the ground? Following up on my own post. I change to the other dog (the black, white and brown one) gave it 2 raw prime meats and an apple and it took me to treasure. I then reload my game to before I started messing with the dogs (so I would get what i wasted on the brown dog back). Checked the spot that the dog took me to. And nothing was there with magnet. Went back to the multi-colored dog, feed it 3 apples. And it took me to treasure. So the moral of the start is .. DO NOT TRUST THE BROWN DOG!!! The dog at Tarrey Town isn´t “working” for me. 10 meats and 20 apples later and he´s just standing looking at me. Following up my own post (like the last guy). There are three (or more) dogs at Tarrey Town. Go behind the Goron shop, there is a black one there. He´s the chosen one. Fruits do work – I fed the Lurelin Village dog three apples and one spicy pepper, and it led me to the treasure. I can’t get Tarry Town to work. I’ve befriended all of the dogs and none of them do anything. Note: Snowfield Stable has two chests and three dogs. When I did it, the darkly colored dog in front led me to the feathered spear chest, and the dog in back led me to the star fragment chest. The normally colored dog in front led me nowhere.